Lately, I've been looking for ways to make dinner prep a little easier. So I decided to put together a series of 4 recipes using a rotisserie chicken, something that can be picked up at the store on your way home from work and then combined with a few simple ingredients that may already be in your kitchen. The second recipe in the series is Chicken Roll-Ups. Combine the cooked chicken, mushrooms, green onions, and cream cheese in a bowl. 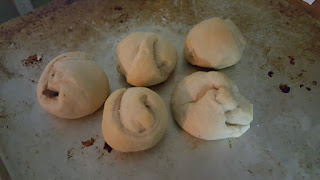 Unroll and separate the crescent rolls. Spoon the cream cheese mixture into each crescent roll. This will take around 2 tablespoons each. Wrap the crescent rolls around to cover the mixture. Arrange the roll-ups on a greased sheet pan. Brush each roll-up with the melted butter and dust then dust the bread crumbs. Place in the oven at 350 degrees. Bake for 12 to 15 minutes, or until golden brown.